It's looked like the purchase of a majority interest in the Nets by Russian billionaire Mikhail Prokhorov was a walk. Maybe so, but a chilling charge surfacing in Moscow raises questions about Prokhorov's business interests and an alleged effort to silence a journalist. It hasn't yet caused public ripple effects in the approval process being conducted by the National Basketball Association, but it certainly deserves scrutiny. If you don’t know who John Helmer is, you should take the time to find out: He’s the journalist residing in Moscow who has been a pebble in Mikhail Prokhorov’s shoe since oligarchs have been collecting their billions under the protection of a corrupt, Fascist state. In other words, he’s the kind of journalist who turns up dead once a month or so inside Putin’s Russia. Helmer said Russian police who interrogated the three arrested men told him the men said they worked for a private security company that had been acting on behalf of Rusal, the [Oleg] Deripaska-controlled giant, which has major interests in the Australian aluminium and bauxite industry through holdings in Queensland. Both the security firm and RuSal deny the charges. 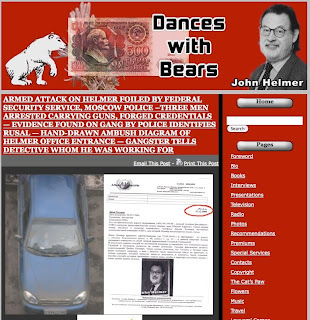 On Helmer's Dances with Bears blog, there are 53 entries under the category Oligarchs. Here's his coverage of Prokhorov. Here's an interview with Helmer.